I just finished reading this novel and I highly recommend it to my fans and avid readers like me. This novel is one you cannot sit down, once you have begun reading it. Great Job Mrs. Carol! After three failed marriages, Ramona Raven is determined never to fall in love again and to find redemption from a lifetime of allowing men to control her destiny. So, in keeping with her Cherokee beliefs, when she dreams of a wild gray stallion, Ramona interprets the dream as a message from the Country of the Spirits. The horse is the key to her salvation. She must find the animal and bring him back to Georgia, the land that contains "the scenes of her childhood and the graves of her fathers." 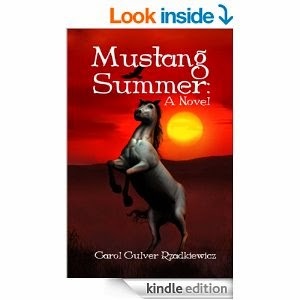 Yet, in order to find the horse, Ramona realizes that she is going to need help. Help arrives in the form of Austin Cahill from Paradise, Texas. A tall, lanky cowboy, with the bluest eyes Ramona has ever seen, and former All-American Rodeo Bronc Rider, Austin is now a middle-aged drifter. Having lost his wife and child in a terrible accident, he is determined to settle down, although he's failed in the past, and to put to rest memories of the Huntsville Prison Rodeo and the crazy stallion that destroyed the only thing he had left--his ability to ride any horse breathing. Accompanying Austin is "his daughter," Killian Russell. Deserted by her own father when she was a child, Killian has run away from an abusive, alcoholic mother, and although learning disabled, Killian is yet smarter than most people when it comes to the ways of the world, so when Austin offers her refuge, she sees it as the opportunity to escape the past and to finally have the idyllic life of which she's always dreamed of. When Austin accepts Ramona's offer of employment, the three of them embark upon an adventure-laden journey that will take them from the rolling hills of Georgia to the sun-blasted landscape of northern Utah. Yet little do they know that this one fateful summer will change their lives forever, for in the days to come they will learn to trust, to love, and to believe in the unbelievable.